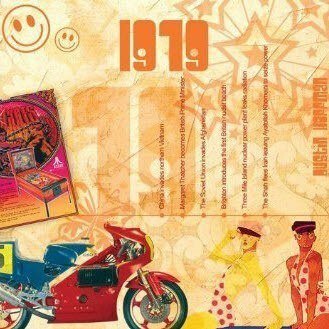 This unique two-fold greeting card features fabulous iconic imagery along with news headlines which will undoubtedly bring back many memories of 1979. The CDCard includes a 20-track compact disc that features an all new music selection with many of the top artists and biggest hits of the Year. An ideal card and gift in one for birthdays, anniversaries or any Special day. Please see below for the full track listing of the 1979 CD. 2. The Jacksons - Shake Your Body (Down To The Ground). 4. Electric Light Orchestra - Dont Bring Me Down. 15. Evelyn King - I Dont Know If It´s Right. 18. Earth, Wind & Fire With The Emotions - Boogie Wonderland. 19. The Charlie Daniels Band - The Devil Went Down To Georgia.